Actress Natalie Portman hosted NBC's late-night sketch comedy series SNL, her second time hosting the show since her first appearance in 2006. That first hosting gig included a rather memorable skit where she performed a now-iconic rap song. Last night, she brought her rapping skills back with another memorable rap, where she returned as her Star Wars prequel character Padme Amidala. While many Star Wars fans may not like it, the rap also brought back Jar Jar Binks as well, exposing a well hidden secret about the Gungan many might find beyond disturbing. The rap started with Saturday Night Live cast member Beck Bennett portraying a celebrity interviewer, who begins his chat by stating that the last time she hosted the show, things got a little out of control. The actress claims she was "going through a really weird time then," but she has "matured a lot" over the past decade. When asked to fill the fans in on what she's been up to since, the Oscar-winning actress broke into a rather profane rap, where she talks about putting dildos on switchblades and Xanax dissolving in her pinot noir wine. She also comments on the bizarre Tide Pods controversy in this new sketch, revealing that Tide Pods are the only thing she snacks on, making a reference to her Oscar-winning role in the 2010 drama Black Swan. When Beck Bennett mentions that she seems exactly the same as she did all those years ago, only with current references, the actress reveals that isn't true, because she's a mom now and that has changed her whole perspective. She then breaks into another rap, where she claims that she didn't even push when she gave birth and that she was "blazing" on "bomb kush." The rap interview takes a rather hilarious turn when Beck Bennett asks if she has seen the new movies in the Star Wars franchise, and as he's about to say they are "so much better" than the prequels, the actress cuts him off by stating, "So much better than what?" 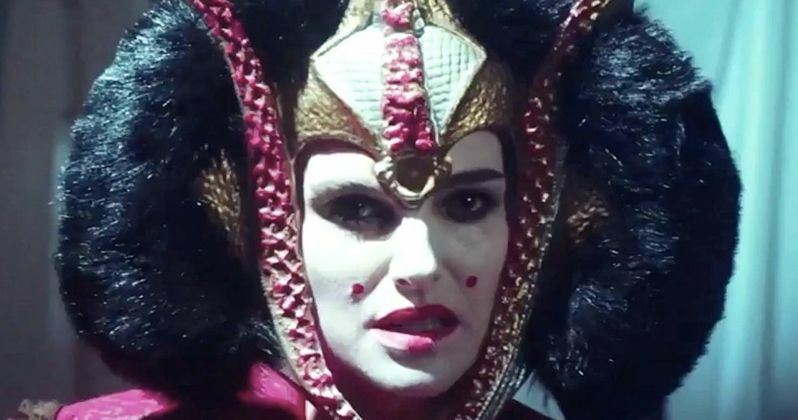 The video cuts to the actress bringing back her iconic Queen Amidala character with full makeup, which was a huge hit among the Star Wars fans in the live audience. There is even a surprise appearance by former SNL cast member Andy Samberg, who was part of the first Natalie Portman rap sketch. The sketch goes onto features perhaps one of the most controversial Star Wars characters of all time, Jar Jar Binks, who makes a brief appearance at the end. In case you didn't see the sketch last night, you can take a look at the entire rap below, courtesy of SNL YouTube, along with the original rap from 2006.